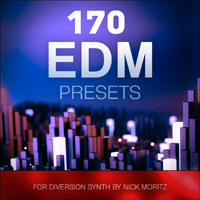 170 EDM presets for Diversion for any modern dance music production. All sounds in these 4 demo tracks (except the drums and percussions) are from the 'EDM Diversion' presets pack, and are generated purely by the VST synth (without any external processing). These tracks created for demo purposes only. Each of 170 presets has a morphing pad assignment. MIDI or any melody files are not included in the pack. Presets were created by Nick Moritz.